We’re serious about food at Alea Nottingham – and that means we serve some of the best in town. Not only are we home to a celebrity restaurant from the godfather of modern cooking Marco Pierre White, but we also boast an extensive Players Menu bursting with all your bar food favourites. Our cocktails are pretty special too. But don’t take our word for it. Come down and discover for yourself what makes Alea Nottingham an unbeatable choice. 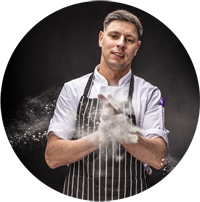 Well versed in signature specials, but equally comfortable with simple, straightforward dishes, Senior Sous Chef Raf Panek brings a wealth of knowledge – and delicious recipes! – to Alea Nottingham.